I think I actually sign up to review books so that when I need to check out for a while, I can read and say I’m crossing something off my to-do list. Yup. That’s me. The last few weeks were crazy town. I had work to do on my book, but honestly, I was too brain dead to create. Some people turn on the TV. (I think it’s been a month since mine was powered on for something other than an Extreme Weight Loss workout video). I hang out with my Kindle. And so last week I opened up Stratagem and fell into the world of Hunger Games meets corporate team-building meets family drama and…well, murder, she wrote. Just getting through the dedications page got me excited, because honestly, Cara Putman and Cynthia Ruchti are in her circle of writer friends, and we know what I thought about their books! 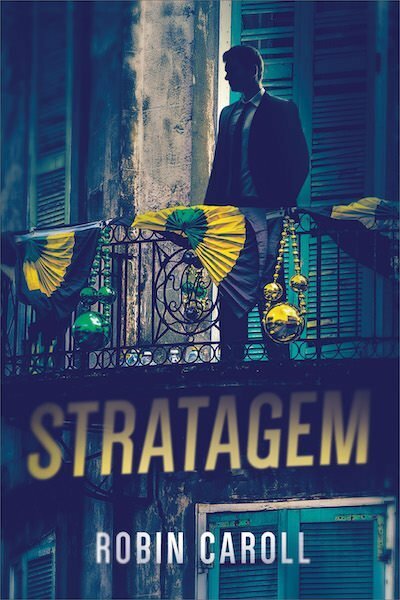 #1 Stratagem was kind of like The Hunger Games, but the good guys are the game makers. Y’all, I love The Hunger Games trilogy. I was a late bloomer (I was in seminary when they made their debut). I remember catching the tail end of one of the first movie when my brother brought it home. He and Dad had already been reading the books, so what did I do? I read the books in one weekend. They’re not short books. I didn’t sleep much. There are a lot of things I could say about The Hunger Games trilogy, but that’s for another post. I actually wrote a paper about the series for my Theology and Film class in seminary. I took Theology and Film so that I would have the vocabulary to process all the things I was processing about The Hunger Games. At some point, I’ll share some of that on this blog. But Stratagem. Imagine The Hunger Games – the game itself. But it’s not a fight to the death, it’s a corporate team-building exercise, or in some cases an exercise to help employers make the best choice for a promotion. A custom game built by a psychologist to get inside each player’s head and bring them face-to-face with their fears. It sounds cruel at first. But to me, it’s a little like physical therapy…not fun, but makes you stronger. And in Stratagem, it almost seems like the game maker is caught in his own game. 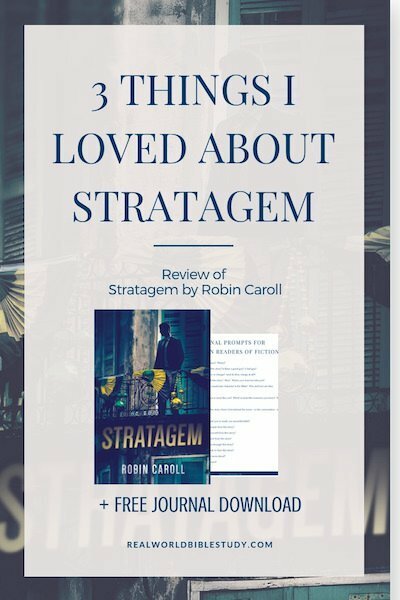 There were some characters in Stratagem that we’re not supposed to like. Except…a few of them came out with surprising strength of character near the end. Repentant, not in an overly simplified way, but complex enough. Or genuinely trying to get things right after getting them so wrong. I found myself wishing I could get to know them better. Is there going to be a book about Danielle? #3 Stratagem touched on some stuff in a non-preachy way. Divorce. Abortion. These are things that many Christians feel very strongly about. Sometimes we don’t do such a great job of feeling very strongly about the folks going through these things, regardless of whether we agree with their choices. Stratagem let me feel the gut-punch of emotions by showing, rather than telling. This is something that Alana Terry does very well with topics that we just don’t talk about much. Even though Robin Caroll didn’t make these issues the focal point of her book, I thought she did a great job of bringing us into the real-life story of so many in our broken world. 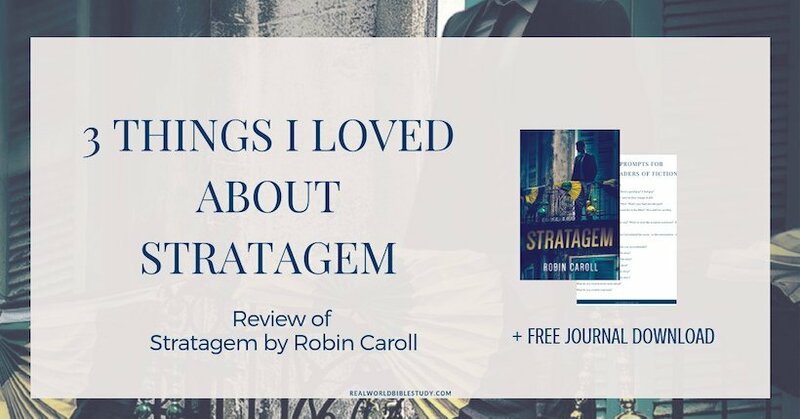 Was there anything I didn’t love about Stratagem? Yes – just a bit. I didn’t love the way the game makers (the good guys) brought in some elements of voodoo into the game to play on one character’s fears. Let me be clear: they weren’t endorsing or practicing voodoo, they were putting things she was scared of in her space and this happened to be what she was terrified of. It bothered me because there is a real spiritual element to voodoo and witchcraft. Our God is more powerful. Period. Absolutely, all the time. But in their shoes, I wouldn’t have wanted to bring those things in, even in a game, because it can make light of something with real spiritual power. Also (and maybe this is a personal thing), I would have liked to get to know the murderer before we found out that person was the murderer. I’m being super vague here to avoid spoilers. But sometimes authors don’t give us all that much exposure, in their attempt to keep up the mystery. A really well-done mystery can let us get to know that person without giving away whodunit. Stratagem is on Tour with Celebrate Lit! “I love boxing. I love Hallmark movies. I love fishing. I love scrapbooking. Nope, I’ve never fit into the boxes people have wanted to put me in.” Robin Caroll is definitely a contradiction, but one that beckons you to get to know her better. Robin’s passion has always been to tell stories to entertain others and come alongside them on their faith journey—aspects Robin weaves into each of her twenty-five-plus published novels. When she isn’t writing, Robin spends quality time with her husband of nearly three decades, her three beautiful daughters and two handsome grandsons, and their character-filled pets at home. 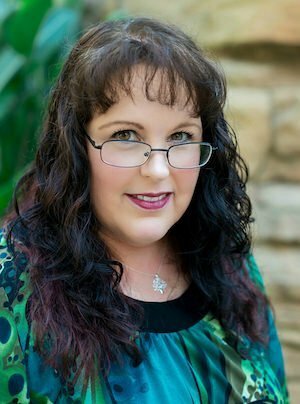 Robin gives back to the writing community by serving as executive director/conference director for ACFW. Her books have been recognized in such contests as the Carol Award, Holt Medallion, Daphne du Maurier, RT Reviewer’s Choice Award, Bookseller’s Best, and Book of the Year. Thank you for journeying to New Orleans in a web of deceit and confusion with me. Sharing a place that has such a connection for me was a pure joy. South Louisiana offers such a laid-back attitude that I often miss “home.” I hope you’ll enjoy sampling a taste of the flavor of Louisiana. 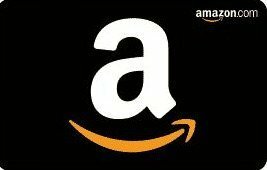 Thank you for participating! Glad you enjoyed the story! I would enjoy reading this suspenseful book.